April 22, 2017 marks the 47th Anniversary of Earth Day, a global initiative to demonstrate a commitment to environmental conservation efforts. Various issues of political and social concern have come to the forefront with pressing matters such as climate change and global warming in recent years. This year Google has revealed their plans to release a new version of Google Earth especially for 2017. Environmental science and conscientious consumers have joined forces over the last 40 plus years to create a sort of counterculture in the Western World, concerns about air and water quality have turned the Environmental Protection Agency into a household name. In 1962 Rachel Carson' New York bestseller Silent Spring was published and this was a catalyst for increasing public awareness regarding the correlation between pollution and public health. That first Earth Day in 1970 gave a tangible voice to the need to protect the environment. 1970 saw the creation of United States Environmental Protection Agency and the passing of the Clean Air, Clean Water and Endangered Species Acts. Fast forward to Earth Day 2000 and by this time Earth Day blossomed into an international grassroots activist endeavor. Citizens around the world united to express a desire for decisive action on issues impacting global warming and clean energy. In 2010, Earth Day Network brought 250,000 people to the National Mall for an the largest environmental service project to date. A Billion Acts of Green, a global reforestation campaign that has developed into The Canopy Project. Earth Day celebrations and initiatives have grown and developed to include over 192 countries and has become the largest secular day of observance. There is one planet that we all call home and it requires a join responsibility to maintain clean air, water and food to sustain its citizens. One of the best ways to instill respect and appreciate for the planet is to teach kids about different places and cultures. A globe like the Oregon Scientific Smart Infinity is a great way to teach your kids about the world around them this Earth Day. This globe overs wireless exploration with the accompanying Smart Pen. A local supplemental map for geography lessons as well as Apps for interactive learning and a connection to a PC for updated, current information. This device includes over 30 fun and educational activities and a Micro SD car provided content memory storage. Audio notes can be recorded with the Smart Pen. At 13-inches x 11inches x 15 inches this is the perfect size to fit in a child's lap or be taken on a road trip. 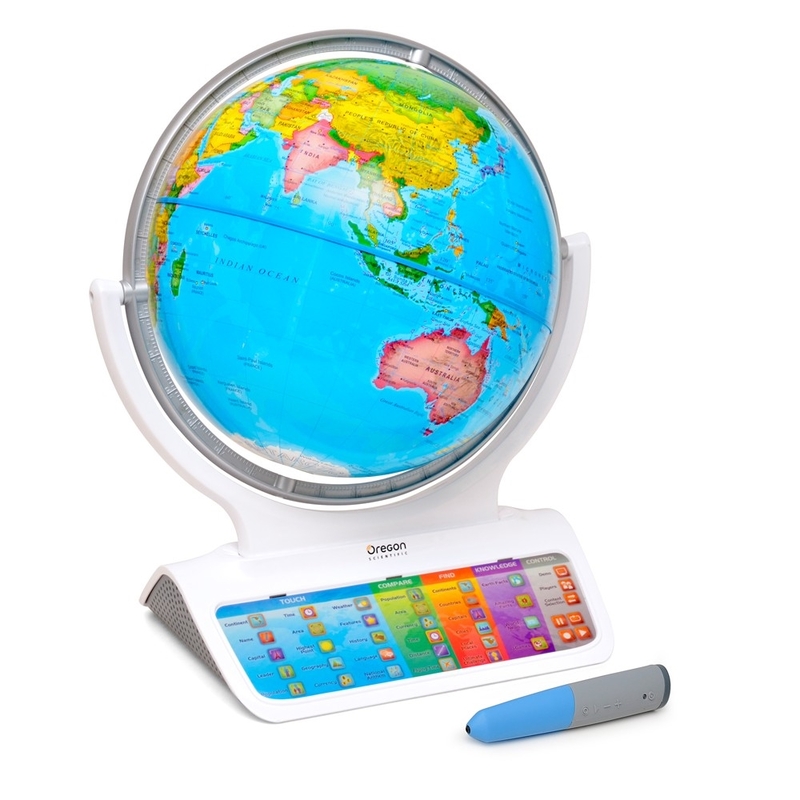 The Oregon Smart Infinity Globe can help children develop a sense of global consciousness. An understanding that Planet Earth is home to many different people, animals and other life forms helps encourage a respectful and responsible attitude. Respect for the planet is about simple things like not littering. There are so many simple steps a person can take to reduce their carbon footprint.